Market Day in Rumsiki, 1990 Cameroon, Far North Province (Region), Rumsiki – 35mm film Africa 1990 People swung and dipped and twirled, then they stopped to drink some of the local brew that is prevalent in the market place, returning to their dancing with renewed fervor. I just stepped off of the plane. Now, I’m sitting and writing. It’s 5pm. Well, one thing was right. I wore my shorts. It feels like there’s 90% humidity. Before we landed I could see the river flowing to the sea, the area surrounding, flooded. Nothing but trees for hours before we arrived – and I’ve flown from Kinshasa to Lake Kivu – same thing – from Kinshasa to Gabon (Libreville) – it’s all nothing but jungle. No one can ever see all of the earth, nor even a little part of it. How many trees down there? Like grains of sand on a beach. We will never discover everything on earth. I tried to make an evaluation of my first impressions as I headed down the ramp. Something bad has happened here. You can always see it in the eyes. Beaten like animals. I reflected that they were colonized by the Germans. Yet I thought ‘I love this place,’ and I thought there is much new to see here. I passed women wearing dresses with much-exaggerated shoulders – puffed out, reminiscent of the dresses they wear in Uganda. Perhaps they were from there. Passed military men in khakis, red berets, guns in holsters worn at the hips. One long corridor of cement, and another, windows looking out. Who designed this place? I felt it must be a European, and one who planned it for multitudes of people, who were nowhere to be seen. I think I rather like that. There are few people mulling around the baggage carousel. I am analyzing my next move. One week in Cameroon, one week in Nigeria, one week in Benin and Togo and then I’m off to Europe. Should I climb Mt. Cameroon? If I do that, I shorten the time available to hike in the area around Maroua and Rumsiki. I should covet each day. I like the fact that only 5 or 10 bags have come off the carousel. I need to get away from the bustle. Sitting still, writing, I begin to sweat—perhaps the humidity is 99%. I’ve now got to deal with speaking French. I can say, “It’s not cold here” incorrectly. Il ne pas foit ici. Perhaps, I reflect, I would like West Africa more if I spoke French. English-speaking Ghana was one of my favorites. Yet in another sense, it makes it more foreign and adds an air of mystique. Besides the people, I aim to photograph in the markets – do I need a permit?—maybe they speak no more French than I. Now I refer to my almanac and discover that English and French are both official languages. Perhaps the mountain people speak Foulbe, Bamileke, Ewondo, Douala, Mungaka, Bassa or some other language not listed. Now the bags start to come up. The fire is cracking and the taste of fish is in my mouth. I am cozy warm. The rest hut is at 2850 meters, about 10,000 feet. My bare feet are together and the wet socks are on a rock near the fire in the center of the hut. My Thermarest is on top of the straw – the straw smells good and is soft. It is pleasing to the eye and reminds me off the Holy Manger. I am trying to cook tea and hot water for tomorrow’s hike – the remainder of the climb is supposed to take around three hours (from here) to get to the top. The thing that intrigued me the most about today’s hike was seeing Bioko Island (of Equatorial Guinea) across the water. I suppose I am somewhat a victim of “the grass is greener” syndrome – should I not just be reveling in Cameroon? Well, I am that too. The highlight of my day was taking my camera and tripod down the hill and shooting photos using f32 of the side of this volcano, beautiful green, and the valleys below, the ocean, the rivers, the city, and Bioko – all cast in a cloudy haze. The colors were not brilliant, for the sun was behind clouds, but the mere fact that I had time to look, the quiet, the view giving a sense of height, the crisp air – these filled me with happiness. Unharried and untroubled – only for a moment – just to have the time – that is the ultimate. Last night, I slept in Bafoussam… El Hadj has me semi-formally as his guest this evening. I will write by candlelight. Crickets and frogs are heard faintly, the radio from El Hadj’s adjacent room, an occasional vehicle on the road – and, I suppose it is the caretaker, who occasionally shifts in his vigil to watch me write, as he lays on his bed and I on my mat on the floor. I am most pleased with today. Every day is a strain – because everyday I must map out the logistics of how I can squeeze the most out of it, and how things fit into a large scheme of what I want to do in this pittance of time given the human life! I am pleased because of the, can I use the word, ‘synchronicity’ of the occasion. It was merely by sighting the obvious that I have ended up here. 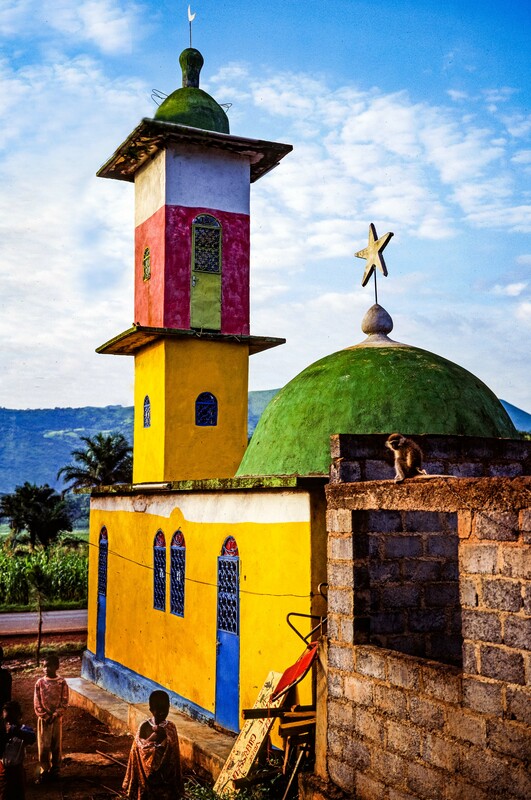 I was on my way to Foumban when I spied a most beautiful mountain – it was unnamed on my map – and coincidentally, we passed what I considered a most beautiful rural mosque. It was made, it seemed, of earth, and painted yellow, white, blue, green and red. There’s a unique way that paints stand out on earth structures, especially after some weathering and in the equatorial light. I was fascinated immediately by the mosque because besides being the class of structure which I am constantly trying to capture on film – it had the additional charm of being a homemade rural mosque. I vowed on the way back that I would photograph it. The more I thought about it in Foumban, the more intriguing this notion of climbing this unnamed mountain became. The map I studied was as always a gambler’s choice – for no map can adequately import a sense of being there – and the more I studied it, the more possible routes to take there were; Jakiri to Bamenda, Bunzo to the north, straight to Yaounde or Bamenda or to climb the mountain and, maybe sleep in the village with the mosque. I am, as I stated, content, for I am tired of staying in hotel after hotel. How much more adventurous to sleep in villages. I am content because I used my past experiences to instruct me that all I need to do is to drop myself where I want and ask around for lodging. In this particular case, I photographed the mosque as the van sped off. The people in the bus seemed to think it was impossible to stay here, six kilometers from Foumbot, but I reasoned if I could not find a place then I could catch the next vehicle into town. When I photographed the mosque, the woman and children there didn’t seem to mind, and I asked whether it was possible to climb the mountain and find a place to sleep. The woman pointed up the path to two men sitting on the bench and told me in French to speak with El Hadj. He says that there are three mountains in Cameroon. Mt. Cameroon, Mt. Batpit [Ed. Note: actual spelling is Mbapit] and another I didn’t get the name of. Mt. Batpit is the one above the village. A boy on the bus told me there was “sable mouvant” – that is, quicksand, on the way. El Hadj tells me there’s a mountain lake in between the peaks. A volcanic lake – and he also related that there are lions there. I can hardly walk. Not only did my thighs cramp a bit on the walk up Mt. Cameroon, but the rapid descent I took wore out my legs. A man I met this morning told me he was sick for two weeks after climbing the mountain. He said he couldn’t move and didn’t want to do anything. Yesterday, the winds at the top were on the order of 100 kilometers/hour. In an instant, the video camera got sopping wet and was unusable for the rest of the day. El Hadj gave me a calendar with his picture on it. He’s a traditional medicine specialist. His calendar says he can cure mental illness, impotency, sterility, rheumatism, elephantiasis and tuberculosis, to name a few. He travels to Yaoundé monthly and invited me to go with him day after tomorrow, but I’m afraid my timetable dictates that I’ll not be able to. I am, in summary, content, because I have climbed Mt. 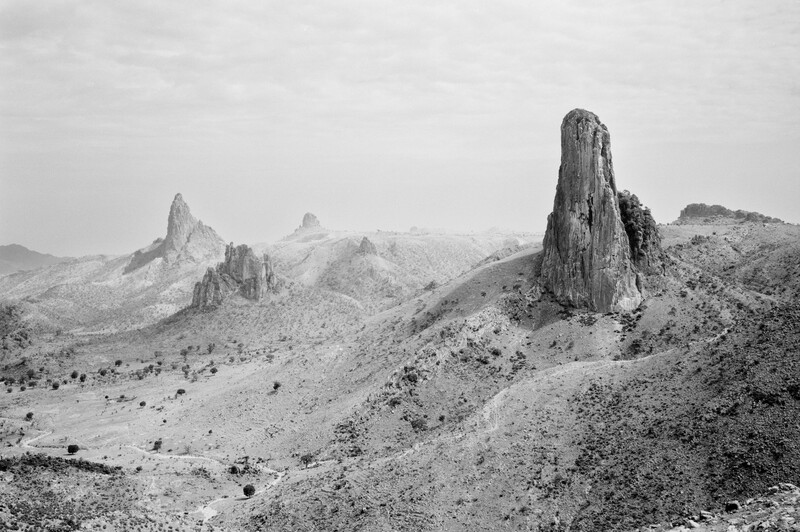 Cameroon, come across what could be one of the most famous peaks in Cameroon, I’ve turned an interesting experience by creative thinking, and hopefully I’ll get just the right shot of the mosque tomorrow. This mountain intrigues me. When I saw it a second time, I said to myself – I don’t care whether it is as high as or well known as the rest of Cameroon’s mountains – it is so picturesque. I had made the right choice with my limited time. It has been a fine, fine day. It is still light out and I am riding shotgun in the 15-seater van to Yaoundé. I awoke about 6am. El Hadj drove me to the trail head for the volcanic lake. The walk was tremendously pleasing, the greens being vibrant, only matched by the greens in the Strickland gorge in New Guinea. The terraced fields make the countryside have an organized, pleasing arrangement. The volcanic lake was unique in my experience – it was near-impossible to go down to, for the walls were several hundred feet high all around, so vertical as to force quite a climb. The greens were intense, so intense, very beautiful. The combination of volcanic soil, the tropics and the abundance of rain provide unsurpassable lushness everywhere. I hiked over a hillock towards Mont Batpit and spied goats on its top. The goats abandoned the summit as I approached. Thatched hut village below. I returned towards El Hadj’s place after a full morning of photography and video-making. I walked past rows of maize, with the interspersed coffee trees and the ever-present banana. I had gone over six hours without food. El Hadj is essentially a modern-day witch doctor. I had the good fortune to witness his divining method. He took me to his doctoring room. All over the walls were fetishes of one sort or another. He placed four feathers with clay bases flat against each other on the ground and put a carved bowl over it with leaves in the center of the top. He pounded on the ground. He lifted the gourd. I noted that the feathers still lay flat. He placed the top over them again. He asked the gourd if I was good. “Jeff c’est bon?” whereupon he lifted the gourd again and the four feathers were straight up in the air! I was, I must admit, quite taken aback. A feeling came over me in an instant. I felt I had just witnessed magic! I was truly impressed, and I was even a bit glad that the spirit had decided in my favor. He would not allow me to film an explanation of some his “secret” pieces. One was a flat silver flask, which he said was 130 years old. He claimed if you put water inside of it and drank it, that it would protect you from accidents. His example was that you would get into a accident and just brush yourself off. (He brushed off his jacket in display.) Another piece he showed me was a cluster of feathers with what looked like some cowrie shells, aged-old blood from sacrifices, and a chicken foot. It looked quite ancient. He said it was very powerful and that it was 300 years old. He claimed that if its powers were employed, a person could be shot with a bullet and that it wouldn’t harm them in any way. He demonstrated this “pow-pow” and motioned with his arms to show the bullets ricocheting off his body. He showed me another piece to be worn about the neck. This protected against vampires. It seemed his magic was designed for protection and healing. He showed me a fetish about 20” high. It seemed quite old and certainly well-carved and adorned. He said it was very powerful and very costly, about 200,000 francs (about $750). I would have liked to take it home. Another small fetish rattled, and I noted it had a wood plug presumably where the rattle was inserted. I later asked him if his father had been a “doctor” also – he said his father was dead, but that he had practiced the same profession. The thing that touched me was that he offered me a thousand francs so that I could get something to eat in town. I told him that it was I who should be offering him money. It was ironic that in order to offer me the money in private, he beckoned me around the corner of the house, saying, “Come, I want you to see something,” and I was afraid, for moments before, he had balanced my binoculars on his shotgun in order to look through them, and I had a wild fear that he was trying to bring me to the back of the house to shoot me! This was partially due to a premonition I’d had yesterday that I would come to this place ‘and never return again’ with an imaginative reason that I would be transformed or swept away into a tribe or another world. In the process of showing me his fetishes, he handed me two balls of lead about one inch in diameter each. I wondered if this was part of his sterility or potency medicine. I am most relieved to be on this train. Fortunately the other three men in my booth are quiet. It would be most unpleasant to sit next to the typical Cameroon man, who is given to loudness and, though perhaps with good spirit and a sense of sport, rather argumentative, at least from what I’ve observed. To me, these are not an attractive people, neither physically nor in attitude. However, on the whole they’re not unpleasant. Yesterday, Cameroon won its second game in the World Cup soccer tournament. The two victories are a source of pride, and they give the Cameroonians a topic on which to offer their opinion, usually in an authoritative tone. It seems they can’t discuss something quietly, but every offerance of opinion by one must be challenged by the other. In Douala, I witnessed the most amusing examples of this while waiting for my bus for Bafoussam to depart. At any given moment one could turn in a given direction and find groups of men heatedly arguing with one another. They waved their hands and yelled at each other in French, back and forth – the others watching joined in, each offering their opinion. When I went to eat, I lifted the lids of the pots to see what the fare was. The woman selling the food didn’t seem to mind, but this excited one group of young men to take great offence and they each began to jabber at me excitedly and mimic me lifting the lids, presumably to demonstrate how offensive it was. I believe they fully expected me to take up the challenge like any good Cameroonian, but as I did not understand a word they said, I couldn’t reply even if I had cared to. This was an unexpected response – perhaps they didn’t know how to deal with this “tactic.” However, another group of young men assumed my defense and as I turned my back and ate, the two groups conducted a debate. While we wanted for the bus to the airport, I commented on this ritual to my fellow passengers. I gesticulated and grimaced, mimicking yet another argument that was taking place outside. This delighted them. I feigned disgust, rolled my eyes, assumed a haughty expression, threw my hands in the air, tossed my head back, swiveled my shoulders and twisted my body. They were greatly amused at my reenactment of the conduct of the individuals not fifteen yards from us. One man commented that this was known as “Op ai” that is, “Up high,” in which one man would attempt to intimidate his opponent by raising his voice higher than the other. I wondered whether this existed before the French ruled here, for I could not help but compare the gesticulations with the image of an angry Frenchman. These people are accustomed to crowding, discomfort and delays. When I first approached the van and I asked when it was leaving, the answer was “immediately.” Two hours later, after they had finally filled the 15-seat vehicle, the driver drove fifty yards into a gas station, shut off his engine and began to argue heatedly with everyone in the vicinity on the latest controversy. To wit, a young woman with two children had only paid one fare and her children were taking up space, preventing the driver from sandwiching the 14th passenger into the van. It made no difference that this woman had asked him over four hours earlier if she could ride for only one fare and that he had agreed. She sat patiently from 2pm until the bus was ready to depart, it then being after 6pm, when the driver took it upon himself to turn face and demand more money from her. The outcome, after an extremely heated interchange involving a myriad of participants, was that the woman paid an extra 1000 CFA ($.37) and a 14th passenger was sardined into that row, making 4 adults and 2 children overall. After that was settled, the driver took a time out to count his money. This continued for an extended period. The driver wanted to corroborate each fare with the man who had collected it. Eventually, I went outside to where they stood and appealed to their business sense, reminding them that their paid passengers were waiting. We departed at ten before seven, arguments still in progress at the bus depot. The crowded passengers in the seat behind me seemed to take it in stride. They hardly seemed to mind the conditions, which would be considered a violation of human rights in my hometown, not to mention a safety hazard. As we rolled down the road, a discussion ensued between two men, then the driver joined in, followed by a man in the far back, and soon, man and woman, one and all, were involved in an exited debate! It’s a national sport. With a view of Mont Zivi and Nigeria, and surrounded by nine boys and one girl, I am watching the sun go down. Birds sing. Deep in the distance a goat bleats. The peace is pervasive. It fills me with a good feeling that it seems has been years since I felt. In fact, it’s so beautiful here, I would be most content to spend a while. I could quite easily spend two weeks here. I would spend my days walking leisurely across the countryside, perhaps alone, and stop and take photographs, recording the speed and f-stop. I would take moving pictures. I would stop and write. This is how I’ve been spending the last two hours. The children are delightful, which surprises me. As they gather around, they speak quietly and allow long periods of silence between their questions or comments. Just now a stick insect crawled up my leg. It looked like pieces of straw stuck together and was about three inches long, light as a feather. The temperature makes me comfortable at this hour in shorts and a T-shirt, sitting. In this month there are no other tourists here. The views are stunning and at this time of year it is green. Hiking is excellent; from just outside of town, the scenes are beautiful and rustic, and in every direction one could hike for hours and enjoy the beauty; and it’s the sort of open scenery where you can see where you are going and where you have been, with plenty of unique, beautiful landmarks to guide you. I have heard of no rules restricting one’s movements. The road is seldom traveled – today there were only a few vehicles on the road – perhaps 10 all day. There are no airplanes or fast cars. There’s food in town and cold beer if you want it. A private hut can be had for 3500 CFA – with electricity, bed, fairly secluded, centrally located. The people are generally friendly and helpful and they seem honest. It’s in an interesting part of the world. 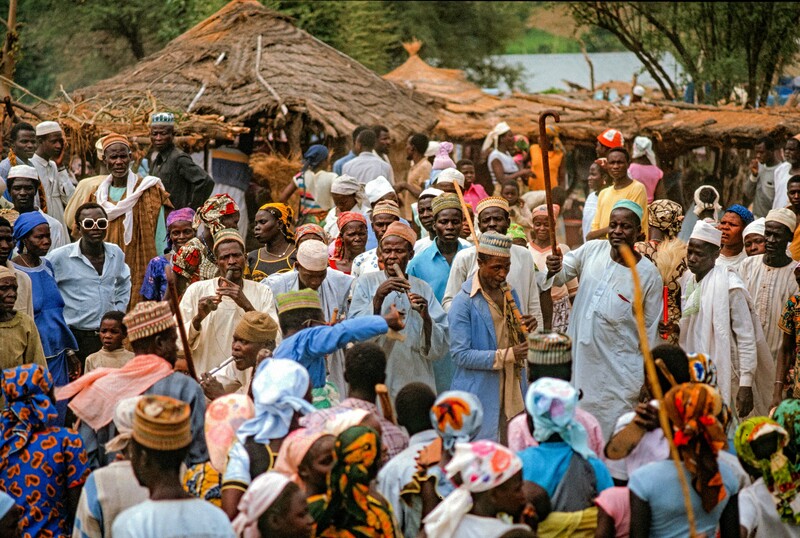 Near Nigeria, Lake Chad, Niger. It is almost an unheard of place. There is water, birds, insects, and goats. A predominance of huts are old style with straw roofs. The only thing I did notice that is too bad is that some of the people ask for money for a photo or for maybe nothing – but that is hardly a problem. Today I found out a wonderful piece of information. All the way from Mokolo, we kept passing and being passed by two military men in red berets. At the Cassarole Restaurant here in Rumsiki, they informed me how to travel on Lake Chad by motorized pirogue from Cameroon to Nigeria. They seemed to have first-hand knowledge. They said to go from Kousseri to Makari -27 km- to Blangla on Lake Chad, then catch a one-day canoe to Baga in Nigeria. This I have got to try. Another thing that intrigues me is to walk the 5 kilometers to Michika, which is purportedly in Nigeria. I would even enter Nigeria that way if there were an immigration post here and if the idea of Lake Chad hadn’t got hold of me. Looking down the winding valley ahead towards Nigeria, it looks to me like Shangri-La, like I would go through its folds and never return, I suppose never want to return. This place is so beautiful, I think I could stay here forever, just disappear. This is a case of the right amount of everything, not too many cars, but enough to get to and fro. Not too much civilization, but there is electricity at night, which I like because I like to write. I would be bored I think if every night I had to sleep after dinner. Hot enough in the day, but not too hot. Cool enough in the evening to be refreshing, but not too cool. People friendly enough, but not burdensome. Not too expensive (though there are places that are cheaper). Good enough food to be enjoyable. Simple sleeping quarters. I barely made it here today. Last night I asked what time there was a car to Rumsiki. I was told 8am, but I didn’t know if that was when they left or started taking passengers. So I awoke just before 8am and didn’t get to the station until about 8:30am. It was the wrong place to get transportation to Rumsiki. They told me to take a motorcycle taxi to the right place. As we drove up, a man said to go to the customs booth and we might catch the truck, which had just left. Apparently, there’s only one truck on Sunday. Fortunately we caught up with it. It was very crowded, but they accommodated me. The 48 kilometers to Rumsiki took 3 hours including a stop for a flat tire and a stop at the Rumsiki market. The point is that the 48 kilometers was a lot further than it sounds. I am just discovering that the thing I enjoy most about photography is sitting and watching and waiting for the light to reach its full potential over a beautiful scene. In this sense, photography is a practice of seeing with intensity rather than merely looking. It forces one to be patient and to look for form, beauty, light, movement – what a delight! It is tranquility and contentment in itself. It meets the two counterparts of happiness itself, that which I deduced to be vitalness and contentment, for it forces one to concentrate on nature’s vitalness while enjoying the contentment of the beautiful scene. In this view, my photography becomes experiential, that is, the primary purpose or objective is to go through the experience. Although hopefully the photographs come out well, it wouldn’t be a total loss if they didn’t, because the memories of tranquility and peace will be unforgettable and add the real value to the experience, if not to the photographs as well. I suspect the tranquility of the photographer may show up in the photograph. I find it interesting to ponder that with some photographs, it’s such a hassle to get it, that if the photograph was lost, it would be only a frustrating memory, whereas with these I am taking, it is so enjoyable, it is a worthwhile thing in itself.